The whole Ghanaian nation woke up these past few days to controversy when the minority Muslim community in the country complained of being discriminated against in the Christian mission schools. They spoke of being forced to attend Christian worship services and devotions in these schools. There have been many reactions, some tempered and some bordering on pure disdain. On the one extreme, the Catholic Bishops conference has categorically told Muslim students to go elsewhere to receive their education if they don’t want to conform to their “campus rules”, whiles on the other end the small but increasing band of secularists in our country have taken advantage of this wind to call for a ban of any form of religious activity in the public square, going as far as to file a Supreme Court case to boot. Whiles we await what the Supreme Court will say, I have a few thoughts to share on the subject. I attended a Christian mission school myself, Presbyterian Boys Secondary School (PRESEC), Legon to be exact. Even whiles a student , I had the sense that the worship services and devotional meetings were more a tool for exerting control over students with a little bit of religiousness attached to it than anything else. These occasions were used to dish out discipline to students, listen to a speech by our beloved headmaster JJ Asare, listen to school announcements, conduct on the spot roll-calls, listen to sermons, conduct dressing inspections and just about everything else in between. Especially during the weekends, students attended these gatherings more out of fear for whatever the school authorities/student prefects had in store for them than for the singing or sermonizing that went on. Of course some of us Christians enjoyed singing Presbyterian hymns and occasionally hearing Mr Dompreh or “Rabbi” the chaplain, deliver a good sermon, but truth be told it could have been done without all the show of bravado that preceded it. And this is what brings me to the crux of the opposition by the mission schools. The primary basis of pushback by these mission schools is that these devotional meetings are a means to keep discipline in the schools. Therefore allowing Muslims or non-Christians the choice not to attend these events will lead to indiscipline since they will have an excuse to miss these events. Secondly, giving grounds for other religions to have some breathing space in these institutions meant that these schools loose some part of their identity as a “Christian school”. 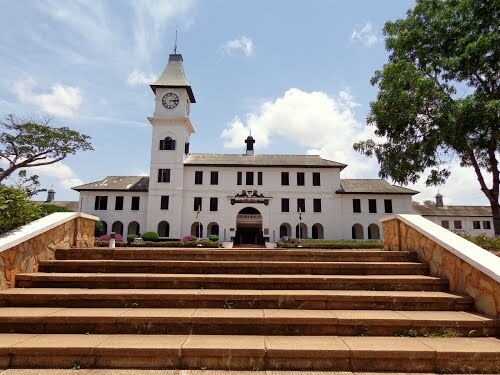 PRESEC liked to refer to its students as “Christian gentlemen”, although it has always had a growing population of Muslim students. Having to publicly admit that not all are “Christian gentlemen” is a bigger blow to the institution’s identity than to anything else. Homogeneity always means easier control and well defined identity. Heterogeneity means more work and the possibility of tension, and who likes more work or tension? But the truth of the matter is that the ground has been shifting under the feet of our Christian mission schools, and a lot of things have conspired to make it impossible for these schools to keep things going the old way. I believe that the express intention of the founders of these schools was not to serve the needs of only those of their denominations or religion, but to do a “social good” by making them open to all that could attend. In fact if this was not their stated goal, most of these schools would not have been granted the lands on which they are currently sited at such concessional rates by the traditional authorities who are custodians of land in Ghana. And this openness to admit everyone who qualifies is exactly their undoing. Today, placement of students into these schools, just like every other school in Ghana is now by a computerized system, which only uses applicable gender and marks obtained at the BECE. As a result, any student can apply to be in any institution. In fact it is theoretically possible (though impossible in real terms) that all the slots for a particular mission school could be filled up by only non-Christian students. What then does one do? Still pretend one’s student population is Christian? Go all out to convert these students to Christianity? So if the worry is about discipline and the loss of these events as a means of keeping students in line, why can’t we split these “devotions” into 2 phases? The first part can be compulsory for everyone, devoid of religious activity and focused on the day to day things that school authorities/student leadership wants to do to keep students updated or to ensure discipline, whiles the second part is left as a voluntary attendance for the Christians who want to attend. After all Christianity has been the religion that makes the most noise about true worship coming from the heart, not being forced. One may choose to then make space for other religious bodies to meet during that time elsewhere, or simply go back to their dorms/classrooms if no such arrangement has been made for them. And given the abundance of Christian denominations now, who says that a Neo-Anabaptist like me will feel comfortable being forced to recite a few “Hail Marys” if I had attended a Catholic funded mission school? Heck, even amongst Christians, we still reserve the right to worship with those we feel we want to worship with, how much more between Christians and other religions? The reaction of the mission schools is a clear symptom of Christendom at work. Christendom assumes that everyone under it’s influence is a Christian, and attempts to treat them as such. It focuses on imposing what it thinks is “right behavior” on people (in PRESEC it’s called “Presbyterian Discipline”), instead of being the example itself. Once Christianity became the dominant religion across Western culture through its adoption as a state religion by Emperor Constantine in the 4th century, Christians – who were beforehand a minority and had learnt to live on the fringes of society – suddenly gained power which they previously didn’t have. This launched Christendom attitudes in full swing, whose vestiges we still experience today. Instead of making sure that people were willingly and truthfully following Jesus, even if that meant a smaller following, it exerted itself in “Christianizing” the culture, imposing it’s morals on a people who still held their allegiance to Constantine, not to King Jesus. Much Ghanaian Christianity rides auto-pilot in this Christendom mode by default, and needs to be reminded on a regular basis that our Messiah showed the way not by simply talking it, but by doing it and instructing us to follow, at the cost of our cultural, ethnic and social standing, and to learn to live at peace with those who don’t share our convictions, even if it means losing our lives. Western culture is now coming out of Christendom, with lesser and lesser people subscribing to Christianity because of a number of many factors, not least of which is the church’s failure “to be the church” as Stanley Hauerwas puts it. Instead of being faithful to its mission to be the place where the disadvantaged, downtrodden, the widow, the fatherless and the stranger go to find refuge as a sign of the future kingdom to come (James 1:27), Christendom engages itself in either saving people for heaven, or engaging in “social justice” as a means to change culture, but very seldom as a means to change its own self. These mission schools represent such attempts to “change culture” through the “common good” of educational institutions, with some of these being built through taxing poor church members majority of whom will never benefit directly from these kinds of projects. “It is good to seek the common good, but not at the expense of personally surrendering to King Jesus. If the kingdom story is the true story, in fact, then there is no good for the common good until humans surrender to King Jesus” – Scott McKnight, Kingdom Conspiracy, Returning to the Radical Mission of the Local Church. In so far as these mission schools were established not only for Christians, but for the “common good”, they have lost the power to be a true expression of the Christian principles, simply because not everyone who attends it is subject the King Jesus. So let’s move on, and make room for the presence of multiple religions in our mission schools. If we won’t give them space to worship, at least let’s not force them into false worship just to stroke our sensibilities and keep us happy. Oh, So You’re A Prophet?